Approaching the end of a transitional season in which its young lineup has been impaired by injury and illness, Stanford’s women’s squash team heads to Boston this coming weekend for the 2015 College Squash Association National Championship Tournament, still with hopes of bringing home a national title. For sophomore CC Ho, the No. 1 player on the team, the national championship involves a whole new level of energy that the Cardinal are ready to embrace. The Cardinal will be playing in the B Division of the CSA Championship, with each division consisting of eight teams. Stanford will be the second seed in the division, with No. 9 Dartmouth being the top seed and Stanford’s primary competition. Stanford has battled injuries all season, which has been particularly tough considering that the team is relatively young — freshmen Sarah Bell and Christie Huchro round out the Cardinal’s top three spots in the lineup after Ho. Sophomore Bailey Bondy, who likely would have been in the top three of the lineup, has been held out the entire year with an injury. Though the team even believed she might be available for this weekend’s nationals, she was not able to recover in time. The No. 10 Cardinal suffered various setbacks this year aside from the injuries. They lost matches to George Washington and Pennsylvania in early January, causing them to drop in the national rankings. Additionally, Stanford suffered 9-0, 8-1 and 9-0 losses to Yale, Trinity and Princeton over the remainder of the month. Considering all of those things, Stanford has certainly done a great job battling through a tough rebuilding season. Although this season may not have gone as well as the team could have hoped, the youthful lineup and return of multiple injured players provides a large sense of optimism for the team going forward. 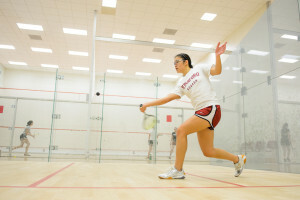 With squash being an East Coast-dominated sport, Stanford faces a number of unique challenges as the lone West Coast representative in the B Division. Ho mentioned the exhausting travel schedule and frequent away games among these challenges. But while they won’t be on the Farm for the championship, many of the Stanford players’ families will be in attendance in Boston. The Cardinal’s first-round matchup against Drexel will take place this Friday at Harvard University. The tournament will continue throughout the weekend, with all games being played at either Harvard or MIT. Contact Sandip Srinivas at sandips ‘at’ stanford.edu and Jordan Wallach at jwallach ‘at’ stanford.edu.